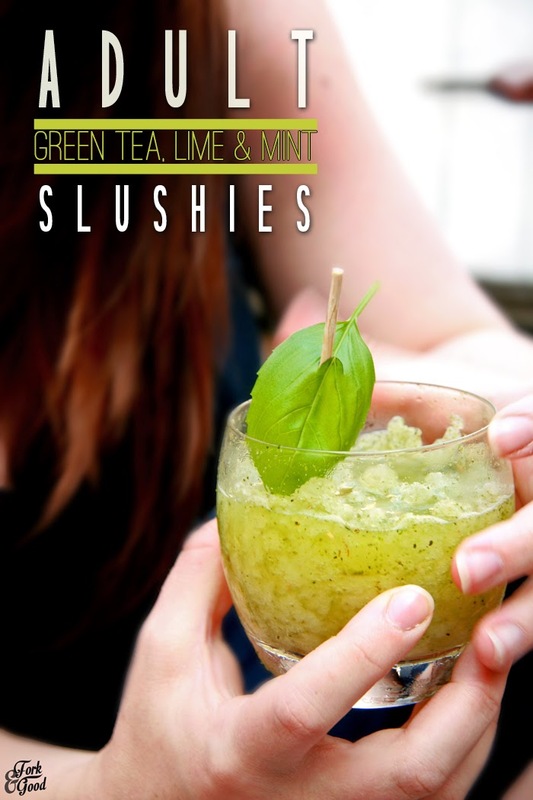 Adult green tea, lime and mint slushies - Fork and Good. When I was 12 years old, every Friday night I would travel to my local sports centre to enjoy the swimming pool. It's been knocked down now, but back then, it was a chlorine filled mecca for pre-teens like me. We would all meet up, swim around for a bit, annoy the lifeguards and dare each other to go dive in the deep end. The deep end is a big deal for me. When I was 12 I was even bloody shorter than I am now, so when I was dared, I said no. I couldn't dive, I couldn't see the bottom and I wasn't doing it. "I will buy you a Slush-Puppy if you do it" said a friend of mine. "..an extra large one"
The large ones were the prize. No one would buy THEMSELVES an extra large. That was an extra £1, and it came in a bucket! It was crazy enough of an offer for me to accept. One disastrous belly flop later, and a big telling off from a lifeguard, I cradled my prize at the little diner on site. My love of slushies pretty much starts from there. For years it was my go-to if I saw the little whirly dispenser behind a counter. Then as the years went by it got more and more 'age inappropriate' to buy them. Finally, a few years back when I decided to change my diet (for my health and because I was quite fat) they started to taste to artificial for me. It sucked. You know when your memories of something are better than the actual thing? Yeah, thanks a lot brain. Then like everything else, I discovered that making your own is so much cooler. So what's with this one? Well, I caved and bought one from a coffee shop and the damn thing was so sugary, sour and artificial that it burned my tongue and made me feel a bit sick. Takes me right back to slurping up a slushy back at the leisure centre, complete with brain freeze and sensitive teeth pain. It's tangy, refreshing and contains no artificialness, no sugar or sweeteners and the best thing is that is also contains tea. Proper tea. 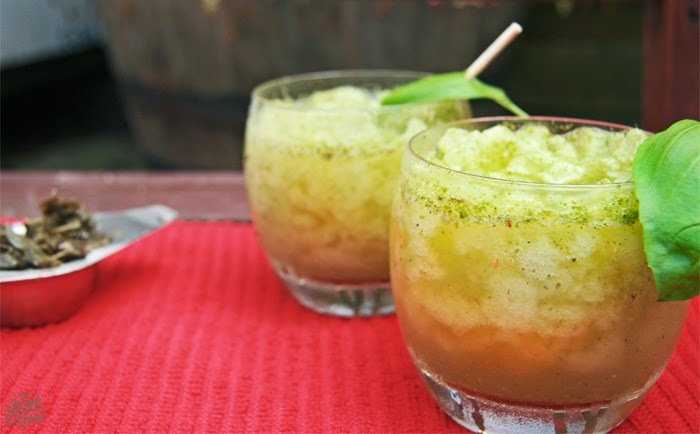 So it's like an ice tea, but with slushy-ness. God I love tea. And it only takes 2 minutes to make. Bargain. This makes 2 cocktail glasses worth. Either 3 teaspoons of loose leaf green tea or 3 green tea teabags. EARLIER ON: Brew your tea (or tea bags) in the hot water for 2-3 minutes. Then filter out the tea leaves (or take out the tea bags) and pop in the fridge until cool. 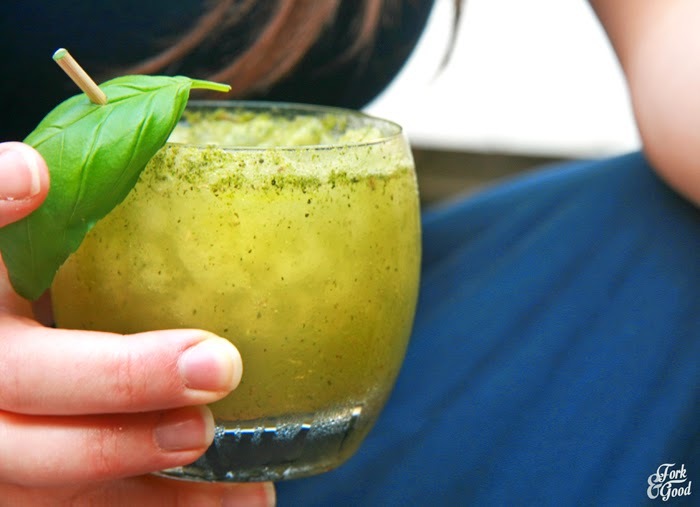 Load up your blender with your ice, pour over the lime juice and stuff in the mint leaves. Next pour over your tea. Pop your lid on, put it on the ice setting (if you have one) and let it blend for about 30 seconds, or until all the ice is crushed. Pour into glasses, add cocktail stirrer and serve immediately. DAMN that tastes good, huh? You know what would make this tastes even better and more adult? A little slosh of gin. I won't judge if you won't. 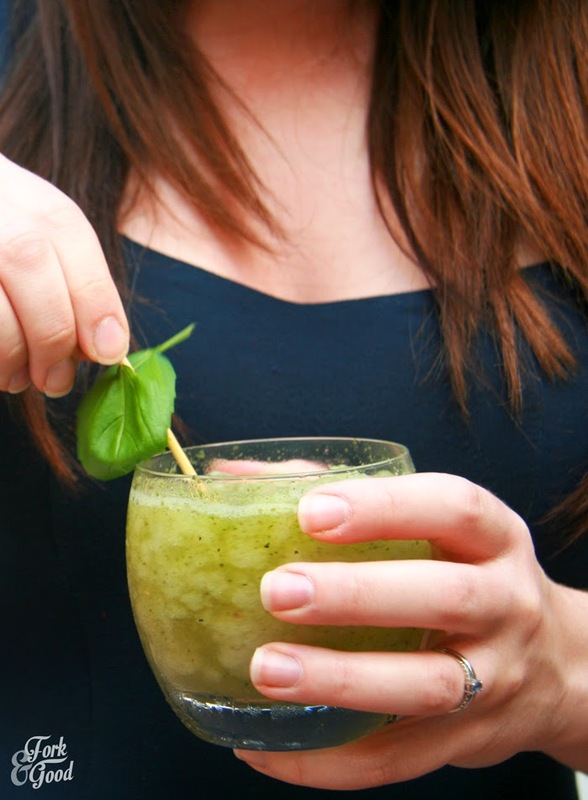 IE: a little tip, if you infuse the brewing tea with 1 or 2 fresh basil leaves it gives it a lovely kick. Just make sure you take them out before you put it in the blender! The basil is a good herb to use for decoration too, cause it smells damn good. Enjoy the hot weather while it lasts! Cheers! You should, it's worth the washing up! Oooooo, I like the sound of this drink! It may even get me to enjoy green tea, which so far I just don't like. 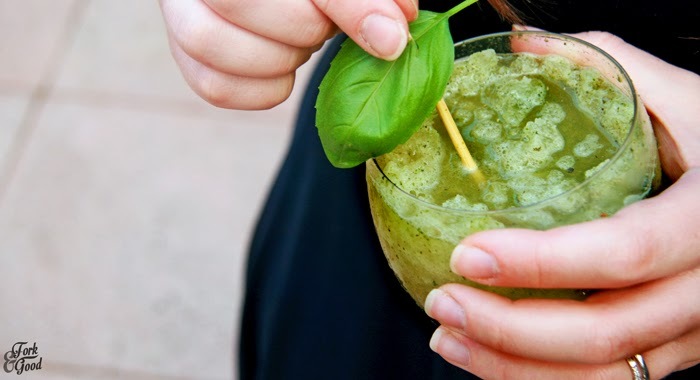 This drink is now on my must-try list! What a perfect summer treat! I love slush, but I am not sure I would have dived to exchange that extra large glass...it's too dangerous. Wonderful clicks, Emma, I love esp. the first one...just beautiful! Thanks Angie :) Ahh, I wouldn't now, but back then... any excuse to show off and get something for free! Ahh I was just talking to someone about how the sweet snacks I had as a kid taste terrible now, it's such a shame. This definitely does not taste terrible ;) I love the green tea base, I'll take anything that adds more tea to my life! It's a shame, but I suppose it's a good one or else we'd eat them / drink them all the time! Yay for tea :) Cheers Abby! I absolutely hated swimming as a kid, probably because my friend threw me in the deep end of the pool and didn't save me whilst I was drowning and screaming for help......glad you have much fonder memories!! haha :) I used to have a slushie from the donut shop next to the pool just before my swimming lessons though! I still like them but only the coke flavoured ones....the other ones are really fake and sweet! Yours sounds amazing! I went swimming each and every week with my friends too. Loved it. Love that feeling when you used to get a tracker bar from the vending machine after and it used to taste so much better from the machine, and you were always starving after anyway. And when you used to walk home with wet hair in the summer and it just felt refreshing. As for slush puppies, I guess you already knew I loved them with my recent summer fruits slush puppy anyway, LOL. I had one around 8 yrs ago (which I was thinking was quite recent-ish, then realised... 8 yrs!) Yup, they've changed since childhood. Still enjoyed their flavour though. Love how you've adultified them. The Brit in me too is screaming over the tea. Ohhh lovely I agree sometimes childhood flavours belong in the past...... blue raspberry anyone??? But this does look like a real good thirst quencher in this heat. I used to love slush puppies too as a child! I remember there were 2 different flavours, one was pink and the other blue. I could never choose which flavour to buy so I always asked to mix them half and half. Most would just half fill with one kind then fill the other half with the other, but the best ones were always where the assistant went from one to the other and I ended up with about 10 layers of contrasting slush. Heaven! Enough of my rambling... I really need to try these slushies! Just to let you know, Gourmandize UK & Ireland have launched a brand new website! Since launching one year ago, our recipe-sharing site has now undergone a complete redesign, now live at www.gourmandize.co.uk! • Refreshed look: A cleaner, brighter site layout makes navigation a breeze. • User-friendly; new drop down menus and categories makes it easier to find what your looking for. As one of our top bloggers we hope that you will enjoy finding and adding new recipes, reading food articles and guides and sharing in our love of food! Oh wow! I love slushies and tea so I must try it. So um...when am I coming over for a glass (or two) of these? Brilliant idea!